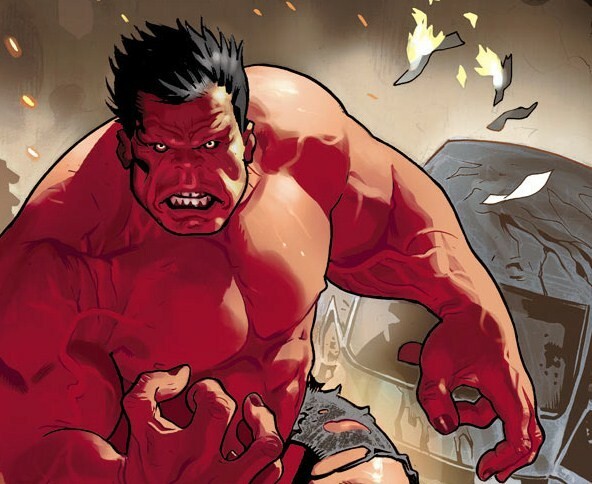 Red Hulk spotted in new animated Avengers trailer | The Daily P.O.P. The latest series of Avengers: Earth’s Mightiest Heroes will introduce new heroes, a new look, new threats and even new villains as well. The latest TV trailer spotlights some of these new foes but eagle eyed readers will notice a particular crimson-hued behemoth in the short teaser. A fallen military hero, General Thaddeus ‘Thunderbolt’ Ross was transformed by the Leader into a gamma-irradiated monster much like the creature that he once hunted like a mad Ahab after his whale. The Red Hulk is capable of absorbing energy and expelling it in explosive bursts. Much as the green Hulk becomes stronger the angrier he gets, the Red Hulk becomes ‘hotter’ releasing more radiation as his rage increases. It is theorized that the Red Hulk will be part of the upcoming Hulk animated series, but it is especially interesting to see him animated into action this Fall. This Post was posted in Avengers: Earth's Mightiest Heroes and tagged avengers cartoon', avengers earth's mightiest heroes, Hulk, Red Hulk. Bookmark the permalink. Red Hulk, Ms Marvel, Vision in Avengers cartoon??? ?